Listeners today are used to pop music that transcends genres and scoffs at pigeonholing. From Hip Hop to Lady Gaga – good pop music today draws upon sound archives, moving effortlessly through genres with the most advanced studio techniques and sampling: Sound-collage is the way to go. Without exaggeration, one can easily trace the roots of this development to the Swiss band Yello. Already thirty years ago, Yello started compiling a kind of trans-global studiotricksound, a branch of music that defies categorization and is so unique there is simply no label that would make sense. What could you possibly call a crossing of avant-garde pop, fake-rap and sound witchcraft, headstrong mix of funk and humor, pre-techno and snappy woodwind sets? Yello has been called idiosyncratic, eccentric, quixotic and exceptional. And they are indeed. When Yello began they were a trio: sound inventors Boris Blank and Carlos Perón with vocalist Dieter Meier. From their inception, the three performed with truly exciting video clips.The videos, which still remain current, represent a congenial visual representation of the extraordinary Yello sounds – almost hypnotic image collages with thrilling cuts that shaped what today we call MTV aesthetics. Yello released their first records with the rather obscure independent label Ralph Records, which belonged to the even more obscure Residents from San Francisco. The Residents were outsiders to the pop biz, more artists than musicians – in other words: Yello’s creative soul-mates. Still, it was quite unusual and proves the exceptional quality of Yello, that a band from Switzerland could make it with the great avant-gardists from San Francisco. Carlos Péron soon left the band to become a producer. Yello now joined the league of the most successful duos in pop history, like the Pet Shop Boys, Wham, Eurythmics or Sparks. The notorious characteristics of a duo are almost always true: one comes to the fore, the other stays in the background. This division is visible with Yello: Boris Blank is more of a shy gadgeteer in the studio, while Dieter Meier shines in public appearances. The same holds true for their work. Dieter Meier once said: “Boris Blank works like a painter in his studio who starts 50 paintings at once” – and from time to time Meier stops by in this studio and does his part by tying them together. Nevertheless, Meier and Blank appear, through their sensibility and passion for style, like identical twins. Yello’s success and their prominent position in the canon of great pop can hardly be overrated. In Switzerland the duo continues to represent a kind of national sanctuary, second only to the Matterhorn. Yello is by far the most successful and seminal pop export of their country. Over and over again singles they released, like “Oh Yeah”, “I Love You” or “The Race” appeared on the international charts. To have such success in countries like Britain for example, remains a privilege achieved by few other bands from German speaking countries. The gimmickry of Yello’s sound art, this mixture of speaker killing sound clarions and humoresque tones, widely appreciated by HiFi fetishists, is so strong that Yello tunes are still used for various Hollywood productions, from “Miami Vice” to “The Simpsons”. At the forefront, of course is the track “Oh Yeah” with that legendary deep voice of Dieter Meier, used in memorable scenes of the cult movie “Ferris Bueller’s Day Off”. Yello has an extraordinary ability to merge the acoustic with the visual. Like nobody else, they almost compose audio-visually and this is one of the reasons why Yello music is in such high demands – even in the advertising industry. Yello music is from the get-go a soundtrack, the visual processing constitutes part of the first step. Also unforgettable is their hit “The Race”, which in 1988 became the theme song for “Formel 1″, the most popular German pop and video clip show from the 80s. Naturally this made the video clip director Dieter Meier, who was also responsible for Trio’s “Da Da Da” video and “Big In Japan” by Alphaville, exceptionally happy. Yello is a band from the 80s, which is when they were also the most successful, yet they remain current like few other acts from that time. If nothing else, the remix album “Hands on Yello” that was released in 1995, proved that Yello continues to influence following generations. Many big names from the golden techno years, like Moby, Westbam, The Orb, Mark Spoon or Carl Cox technofied their favourite songs by Yello – also to make clear that Yello is a significant part of their musical heritage as DJ’s. Yello had such importance for the era of techno, placing them in the elite company of groups like Kraftwerk or the Yellow Magic Orchestra from Japan, a few more of Yello’s creative soul-mates. But Yello is by no means a nostalgia band or just the avantgarde of yesterday, quite the contrary. It is stunning how well Yello has aged. Boris Blank still drives to his studio in Zurich everyday to work on his sound collages. Dieter Meier shoots films and has been represented in various international exhibitions since his contribution to the 1972 Documenta. Their numerous seminal collaborations with various artists including Stina Nordenstam, Till Brönner and the Swiss Heidi Happy, testify to Yello’s relevance today. Many of their collaborators continue to be young protagonists of the music scene, folk music stars like Nordenstam or internationally renowned jazz trumpeters like Brönner. It’s hard to believe they have been working for over 30 years. Yello still prove they know how to expand the boundaries of music, readjusting themselves in a system called Yello. Their last album “Touch Yello” rocketed up the German charts after a silent period of six years, going platinum in Switzerland and demonstrating once more: Yello always remains an extraordinary band. Their unbroken originality is multifacited and manifested itself in various projects such as three futuristic “virtual concerts” in Berlin, Zurich and Vienna, which sold out within hours and became first rate, memorable multimedia spectacles. “Yello By Yello – The Singles Collection 1980-2010″ contains 20 of the greatest hits of Yello’s long career, plus a newly produced and arranged version of their hit “Vicious Games” which features vocals by Swiss pop singer Heidi Happy, making it more compelling than ever. The “Singles Collection” also includes a DVD with 23 visionary Yello videos. “Yello By Yello – The Anthology Box” is an opulently designed three CD set. In addition to “The Singles Collection 1980-2010″ it contains the double CD “The Anthology” for which Dieter Meier and Boris Blank selected their personal favorites, the Yello songs that remain especially groundbreaking for them. 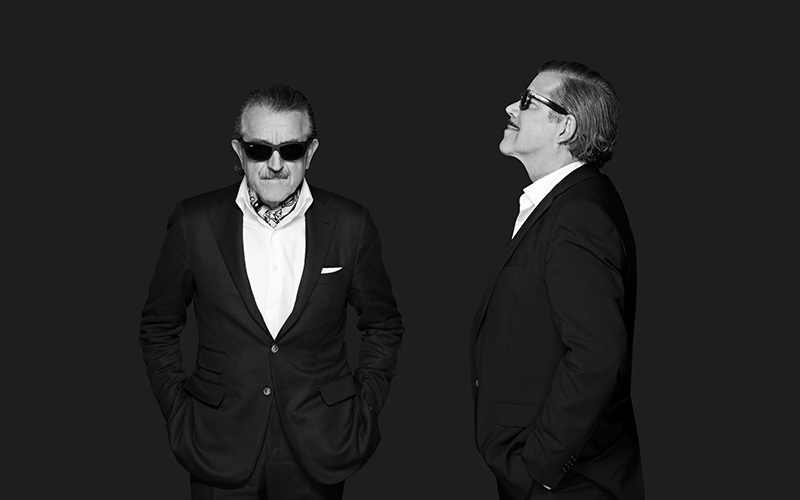 In addition, Yello has included three new songs as a present to their fans : “Dialectical Kid”, “Liquid Lies” and “Tears Run Dry”. Every one of them shows how vital and contemporary Yello remains in 2010. “The Anthology Box” also includes a DVD with all of Yello’s most trailblazing videos. On top of that, this premium set contains a 48 page booklet with rare photographs and personal commentary by Yello on various points of their truly unique carrier.